You've probably heard a lot about "commercial" and "natural" dog foods in recent months, but what do you know about freeze dried dog food? Learn more about this alternative to traditional kibble. Commercial kibble isn't all it is cracked up to be, and cooking from scratch for your canine simply doesn't fit in with your schedule. So, what's your next option for a safe and nutritious means of feeding your dog? The answer may just be freeze dried dog food. Although you're not as likely to find this product on your grocery store shelf or even your specialty pet supplier, there are several brands available online. Freeze dried dog food is actually made from cooked fresh foods with nearly all of the water content removed through a special process. The result is a light and dry product that is packaged in air tight containers for future use. 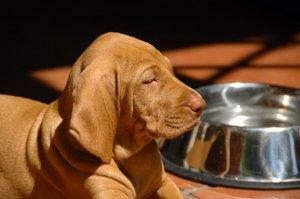 Freeze dried dog rations remain viable for years as long the packaging is not damaged or opened. This is because all micro-organisms need water to survive, so the spoilage process goes into suspended animation. When you're ready to feed your pet, all you have to do is open the package, add a little water to reconstitute the food and Fido's dinner is ready to be served. Now for a little freeze drying 101. Water comes in three stages: solid, liquid and gas. The freeze drying process converts the moisture in the dog food directly into vapor, skipping the liquid stage altogether. How does this happen? The answer is in the operation of the freeze drying machine. First, the dog food is placed on shelves inside of the dryer. Then, the temperature inside of the unit is lowered to freeze the food. At this point the moisture is still present but the molecules have been isolated. Next, the unit generates a small amount of heat while it simultaneously operates a vacuum pump to pull air pressure out of the chamber. This lack of pressure converts the moisture straight from liquid to gas that is then pulled out of the dog food in a gradual process that can take days to complete. The moisture vapor is collected and condensed on freezing coils to gauge when the sufficient moisture is removed from the food. The final product is then packaged and sealed with an oxygen absorbing material as a final preventative measure against spoiling. Dehydration may seem like a slightly simpler solution to removing the moisture from the dog food, however, using the freezing process prior to extracting the moisture preserves more of the nutritional content of the food. Virtually all of the proteins, vitamins, essential fatty acids and minerals remain intact, so your pet derives the most nutrition possible from his feed. Will Freeze Dried Food Last Forever? While freeze drying can suspend spoilage for years, there is still a very small amount of moisture left in the dog food, so eventually it will go bad. However, most of us are not going to purchase a year's worth of dog food in advance, so spoilage really shouldn't become an issue. If you ever find you've kept a package around for a few years, simply give it the sniff test to see if it has turned rancid before you feed it to your pet. There are several dog food brands available in the freeze dried pet food niche. Each claims to use only the finest ingredients, but it is up to you to make sure where their meat source comes from. You'll also notice that while freeze dried pet food may retain a higher nutritional content; it comes with a significantly higher price tag. Steve's Real Food: Steve's promises only 100 percent human quality ingredients in their dog food. A ten-pound bag runs between $25.00 and $30.00. Wysong: Wysong's recipe reconstitutes to a stew-like product. One 19.5-ounce bag is the equivalent of 11, 5.5-ounce cans of dog food and retails for $21.00. Nature's Variety Prairie: Nature's Variety offers a freeze dried version of the raw food diet for feeding convenience. A 12-ounce package retails for $26.00. Real Food Toppers: Toppers is a freeze dried product, however, it comes in resealable foil bags so it will not have the same shelf life as many other freeze dried food for dogs. One four-ounce bag rehydrates to approximately one pound of dog food and retails for $15.99.